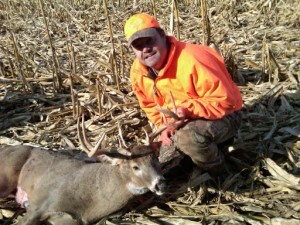 A blog about trophy whitetail bucks. 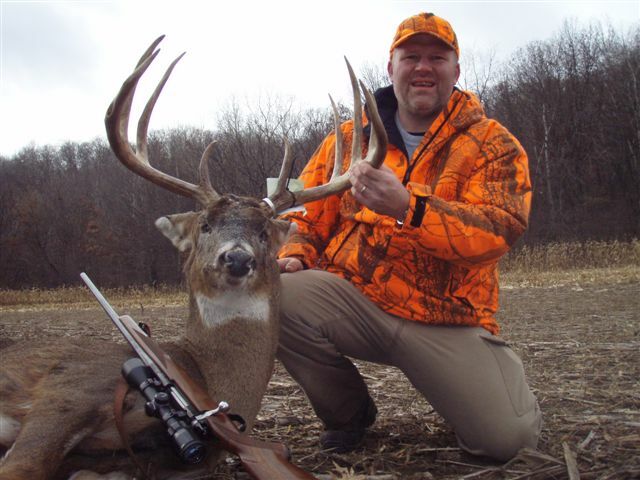 I was talking with a new friend of mine today who mentioned that for those of us hunting in MN zone 300, there is a minimum size buck rule this year. 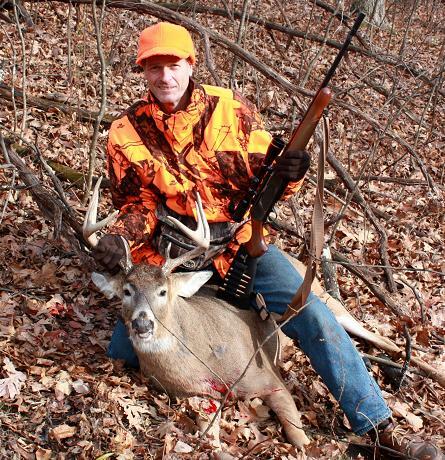 The buck must have at least 4 points on one side in order to be a legal buck if you are hunting in zone 338 – 349 in Minnesota. See page 85 of the regs. Download the pdf at http://files.dnr.state.mn.us/rlp/regulations/hunting/2010/full_regs.pdf. I think this is a great move. Too many times I have seen small forkies tied to the back of a car going down the highway. 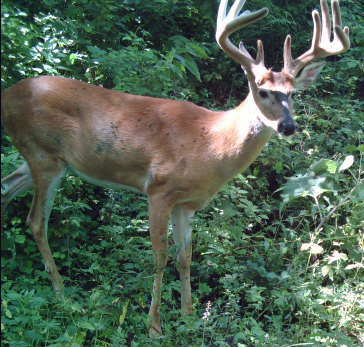 If we want to see bigger bucks in Minnesota, we have to let the smaller deer grow up. According to the regs, this will save at least half of the yearling buck population. Hunters will be amazed at what a 2 1/2 year old deer looks like. Now if only they could lay off the animal until it is 4 1/2 years old. Our team trys to enforce an 18 inch spread on any animal we hunt. Our rule of thumb is that the rack has to be outside the ears in order to shoot at it. That rule has had me pass on some nice deer with tall narrow racks. However, it has also helped me layoff some questionable deer in my career. I applaud the MN DNR for this move and hope that it sticks around for some time to come. Yes I know it is fun to let your child get their first kill and shoot any animal they want. But teaching them quality deer management from the start is a good thing. My first year dedicated to bow hunting was interesting but unproductive. I would chalk it up to over preparing. 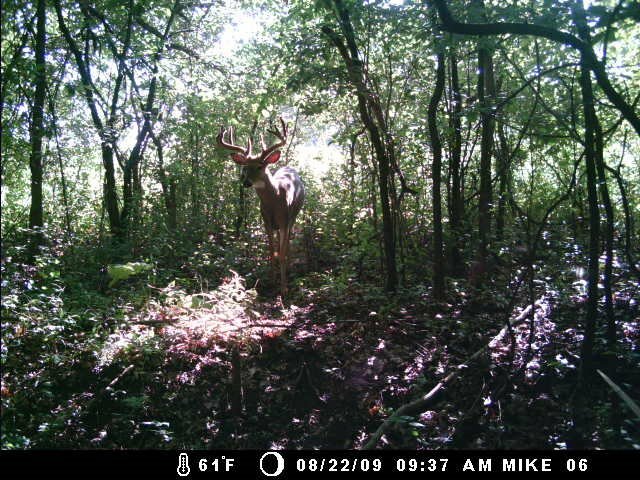 We spent almost every other weekend in the woods checking and moving cameras as well as positioning stands and putting out different attractants. All the activity in the woods did nothing but alert the deer to our presence and send them nocturnal. I hardly saw a deer on our main property. Funny thing was that we hunted two farms but spent the majority of our time on just one property. Where do you think I saw most of our deer last year? It was on the farm we stayed away from. This year we took a different approach. First we are hunting only one farm allowing us to be more focused. Second, we started all of our scouting activities in March after the snow was gone. We found all of the trails and sheds that gave us a good indication of what we had for deer. We put out our cameras once and didn’t check them until we pulled them a couple of weeks ago. We have not spent anytime in the woods in order to keep our stands as fresh as possible. One trip out there in late August just to make sure that the shooting lanes were not obstructed and the stands were all safe. The other thing we are doing different is hunting with a purpose. We have some very nice deer on the farm that we are focusing our attention on. 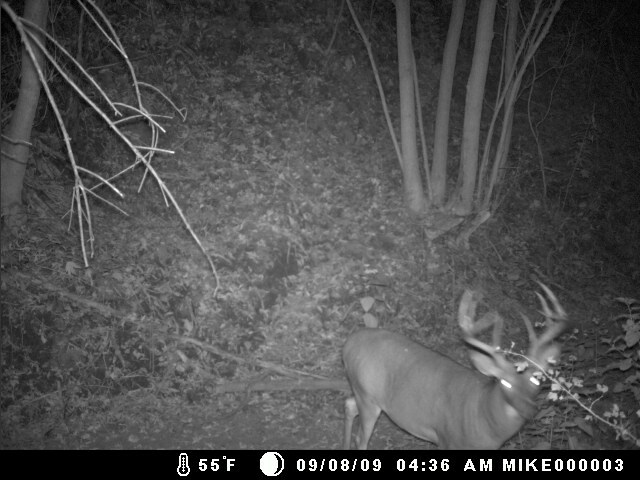 This bad boy showed up on camera and we have decided that we would do best to hunt together to try to bring him in. 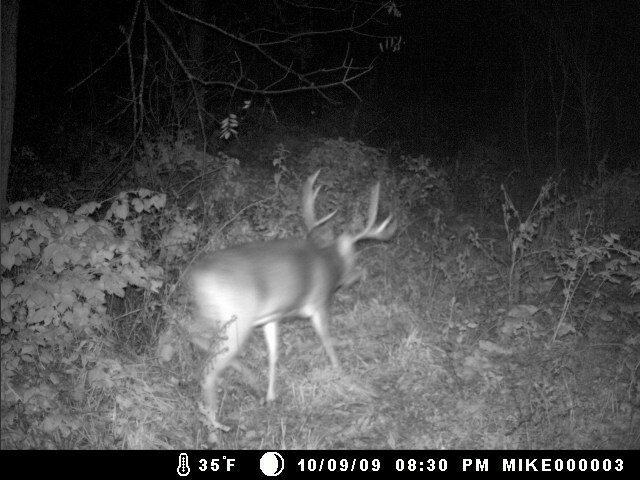 We have had him on camera for a few years now but have not seen him during the hunting season. We estimate that he is 5 1/2 years old and that he is at is peak in terms of health and rack quality right now. We feel that we have a fix on his location and how he moves. We have set up stands in favorable locations based on the movement and will set up our guys so that we have the best odds of bringing him down. 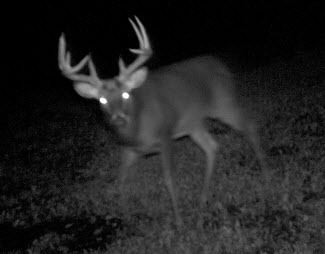 As much as I would like to shoot this buck this year, I would be happy to see someone in our party bring him down. Of course there are other nice deer on the farm that would make me very happy as well. Here is another fine example of a shooter. I am excited to get out there in the next couple of weeks. I have been shooting my bow on a fairly regular basis and feel confident in the equipment. I have been working out pretty regular so as to be ready for the long walks to the stands in some pretty rough terrain. I will be pulling out all the clothing and getting it washed and scent free. Then just one final inventory, a trip to the store to pick up any last minute needs and be ready to go. Can’t wait!! Well I have spent a lot of time in the woods since the last post. Not a lot of action. Last Saturday I was in the woods all day long. Figured the rut was on. I was in a prime stand located between a bedding area and food. Got to the stand early. Stayed in it all day without leaving. Even peed in a bottle to keep my scent contained. The results were 15 squirrels and no deer. I decided not to stay in the cabin Saturday night. Went over to our other farm in Minnesota only to find it dark with no hunting buddies. My choice was to sit in a cold cabin with no computer, TV or any other form of entertainment or go home and watch the Packers play the Cowboys on Sunday. I decided to go home. I understand that a couple of the boys showed up Sunday morning for a hunt. I haven’t heard the whole story yet but one of our guys is having a worse hunt than me. It started when he shot a deer with a bow early in the season. After 2 days of looking, no deer. Then he shot another deer during the gun hunt. Hit it in the shoulder but didn’t kill it. But then came the worst. We had a large 10 pointer on camera. As the story goes my buddy had it come out in front of him. He took aim and pulled the trigger only to blow the rack off the deer. The only damage to the deer was the loss of a set of horns and a loud ringing in his ears. I hope to get pictures soon. I have spent a total of 16 days in the woods. Seen plenty of deer and stand by my claim that I love the bow hunting experience. Being as close to the animals as I have as been great. However, not pulling the bow back on a single animal has been disappointing. The weather has been too warm. The doe are all sitting down in the cool pine trees and I imagine the bucks are finding all the action they need without much of a chase. Some of the boys have had good luck though. Check out some of the results. I haven’t given up yet. Will take a couple of weeks off as the farm is being hunted with rifles this weekend. No place for a bow hunter. I will pick it up after Thanksgiving. 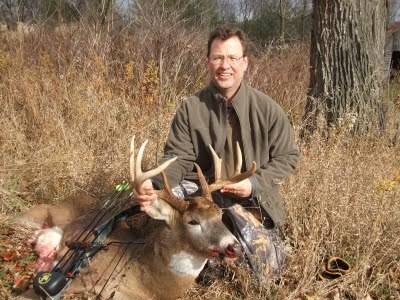 If you have any ideas on how to best hunt with a bow late season, let me know. So last weekend I think I did just about everything wrong that I could. I had only one day to hunt and I think I must have lost my mind. Friday night before going out the weather was crap. Raining and windy, I listened to one of the guys in my group and decided to sit in a nice comfy enclosed stand, with 2 nice chairs and a table along with carpeting, a home a way from home. I knew there was a scrape close to the stand so I figured I was doing the right thing to stay dry and hunt a scrape. I got in the stand plenty early. When the sun came up I put the old range finder on the scrape and saw that it was 52 yards away. Mistake number 1, sit in a gun stand with your bow. My only chance now was to hope something came into the food plot. Mistake number 2, not moving to another stand where I have a better chance. After about 2.5 hours of sitting in the stand and seeing nothing I needed to take a leak. I got out of the stand and for whatever reason I decided to leave my bow behind (mistake number 3). I walked about 50 yards from the stand and relieved myself. On the walk back to the stand I saw the big monster buck walking the hillside right above me. He sure did look nice. Now he was probably 40 yards up the hill and on the move. It would have been a tough shot. I just would have liked to have had the opportunity. Here is the deer I think I saw. I saw nothing else that morning. The afternoon hunt found me in my normal stand. The problem, I am sitting in a 20 mph wind that is blowing in the wrong direction. I think I should move to my buddies stand that is wind favorable. However, I hadn’t asked if I could sit in his stand so I decide to just stay put (mistake number 4). I saw nothing for 4 hours. I did have fun just blowing in the wind for that whole time. I had to walk right past the stand that I wanted to move to. I first noticed that the wind was hardly blowing down in the valley. As I come around the corner on the trail, I see a big deer standing on the trail right under the stand. Don’t know what it was but it looked big as it ran away. Point is I could have been sitting in a much less windy stand that actually had deer by it. So the lesson, know the stand you are moving into, always have your weapon with you and when your gut is telling you you are in the wrong spot, move. Heading out today, Wednesday to hunt for the rest of the week. The rut is on in our MN property and I have personally seen 2 big deer. We have been on the WI property this whole time so MN has not been stirred up. I promise to hunt smarter this week. Another long weekend of hunting with little movement in the woods. The only activity I am seeing is right away in the morning and in the last 30 minutes of the evening. One of the guys in my party saw nothing all weekend while another saw only a couple of does. Makes it tough to sit there for hours on end when squirrels and birds are the only things you are seeing. There’s lots of scraping going on in the woods. Our strategy for the next 10 days or so is to hunt these scrapes. We believe that the key to being successful pre-rut is to be mobile. We found some huge scrape trains so we decided to try our luck hunting these last night. I found my scrapes on a trail we had cut through the woods in order to watch a ditch were we photographed many deer. Here is an example of a buck in that ditch. Last September we built a ground blind out of downed trees and pine branches on top of the ditch just about where this camera is positioned. Saturday morning one of the guys hunting with me said the stand was worthless because anything coming down the trail would be on top of me before I had a chance to draw my bow. I figured the deer would run in the ditch and not on the trail as it provided more cover. So I thought I would give it a try and ignore the advice. I got into the stand at about 3:45 yesterday. At 6:05pm I looked over my shoulder and noticed two doe coming down the trail. My buddy was right. These deer were coming right at me. I hunkered down in the blind to see what would happen. Earlier I had loaded up my scent wicks to the point where even I could smell it so I figured I was well covered. What I didn’t anticipate is that scent would make at least this doe very curious. She walked to within 3 feet of me. We were looking at each other with only the pine branches of the blind between us. I was trying to breath without her hearing me. I had netting over my face so she couldn’t see my features. I am sitting there starring at this doe breathing with my mouth hanging wide. I laugh every time I think of that picture. Now I was concerned what she would do when she finally figured out that I was not a good thing for her and living a full life. Would she charge me or turn and run? I didn’t know who was more nervous, me or her. I had never been this close to a wild deer in my life. After about 15 seconds of this stair down, she figured things out. With a huge wheeze (had there not been a pine branch between us I am sure I would have felt the spray) she turned and ran taking the other doe (who had been hanging back about 5 yards) with her. I stayed frozen until I saw them both disappear into the woods. Interesting enough they ran until they felt they where in cover and must have turned to watch me because when I thought they were gone I relaxed and sat back in the stand. Suddenly the trees above me exploded with snorting and wheezing as these two doe felt the need to tell very other deer within 500 yards that a big bad hunter was in the woods. Since these deer set off every alarm they could in the area I was hunting, I decided to call it a night. I have said it before, I love how close to these animals you get when you are bow hunting. However, that was a bit too close!! We have decided to figure out a better strategy for hunting those scrapes. PS. I was hunting in full ScentLok clothing that my wife made for me when she heard the price of buying the clothes at the store. I was a bit skeptical of hunting clothes that cost $75 to make (coat, pants, shirt, hood and face shield). However, the ScentLok fabric that she purchased at the fabric store worked perfectly in this close encounter!! I spent this weekend hunting the mornings and evenings. I sat in a new stand that I put up in the area where I shot my big buck last year. There is an apple tree there that the deer are interested in. My stand is about 20 yards from that tree. The weather was mild with no wind. Even though there was no wind, I still used a little powder to see where my scent was drifting. I saw that it was drifting in front of me just in front of the apple tree. This was ok since the deer come from behind me to the tree and then out into a field. If a deer showed up, I would have 2 great shots at it prior to it picking up my scent. Once the farmer stopped cutting the hey in the field next to our farm, things got real quiet. The stand is perfect in that it is set up right above a small ditch that the deer cross while on the trail to the apple tree. They make a lot of noise crossing the ditch which gives me time to set up on them. I like this set up because I have learned that moving my bow around in order to shoot is very distracting to the deer and they don’t hang around. At about 6pm I heard my first crash of a deer through the ditch. I was at “DEFCON 3″ with my bow locked and loaded and in front of me ready to draw if it was a nice deer. Turns out it was a small forked buck with a huge body. Not a deer I was going to shoot. However, it was real cool to be about 15 yards away from him as he walked the trail with his nose to the ground taking in big sniffs looking for a little food. I was real interested in what would happen when he got to where I thought my scent was drifting. Sure enough, just as he passed the apple tree his head popped up. He looked left quickly and then right towards me. Next thing I knew he was staring right at me. I closed my eyes real quick in order not to make direct eye contact with him as I knew this spooked deer. I waited about 15 seconds and then opened my eyes just a bit to see him still locked in on me. I am sure the scent was the major issue here even though I am in full scent lock and sprayed down with cover. There is always something on a person that gives off a smell that the deer don’t like. When I have a deer in my area that I don’t want to shoot and I am confident that it is not traveling with another possible shooter, I like to experiment. I decided that this time I would see if the eyes matter so I opened my eyes slowly and stared right back at him. In less than a second after I opened my eyes, he turned and bolted. I guess the eye contact thing is bad. I saw nothing the rest of the weekend except a bunch of doe. No big bucks were to be seen as of yet. The person who rents some crop land on the farm cut his corn this weekend. I sat in a stand we have off of one of the fields and watched the doe pile in. It will be interesting to see if the bucks follow them when it comes time for the rut. Checked a few cameras. 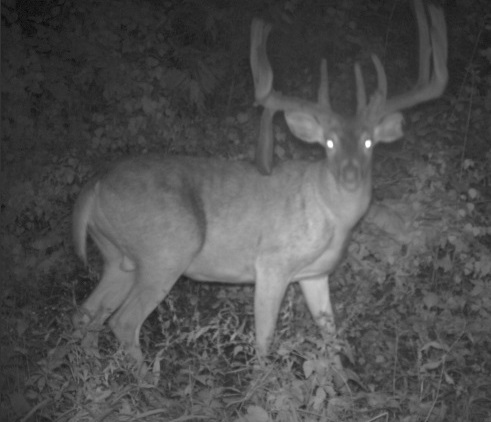 Here is a picture of a nice buck I have on camera. I hope to see him during the day sometime soon. Sorry for the long break without writing. Since I am just a whitetail hunter, the stories and experiences slow down a little in the summer months. Then I have to remember to write. So now I am back and ready to go. Last year I became the Buckmaster in my group for the third time. First 3 timer ever. I have been very lucky in my hunts over the years. When I accepted my Buckmaster title this past year, I told my hunting group that I was done hunting with a gun and was taking up bow hunting. So this year I will be hunting strictly with a bow. I purchased a Mission Eliminator bow this year. I had read that the bow was made by Matthews and was one of the best values on the market today. I purchased it from Schaffer Performance Archery in Eagan, MN. They did a great job explaining the bow to me, letting me shoot several different bows and setting up my rig for me as well. I have been amazed at just how accurate these bows are. Of course it all has to do with the setup and the instructions I got at Schaffer. However, I am shooting 3 inch groups at 20, 30 and 40 yards. I was told that they key to success is to shoot at least a couple of times per week which I have been doing for the most part. I am extremely confident in my gear. I have been hunting with it on 3 occasions now. First time out I saw nothing but practiced moving about the stand and drawing the bow. 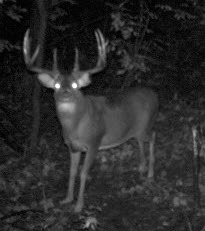 I can see where if you have not practiced your movement in the stand, it would be easy to get busted by Mr. Big Buck when he came walking in. A bow is a big piece of gear that draws a lot of attention. The next hunt I had 3 doe come through but they were behind me where I didn’t have a shot. My primary area was out in front where I have a trail feeding out to a field. Here is a picture from a camera set up on a tree right next to my stand. It looks out into the field. I have since cleared some shooting lanes for the trail that runs behind me. I have not hunted the stand since doing that a couple of weeks ago. I will go back to that spot next weekend and see what happens. Finally I hunted yesterday and had a doe and 2 fawns come in. I got busted when hooking on to my string. Although she wasn’t fully alerted, she new she didn’t like what she saw and moved out slowly never to return. Enough for this post. More stories and pictures to come as I document my new bow adventures. The following is the story of a friend of mine named Kirby. Great guy who loves hunting camp but could take or leave the hunting part. Those are always the guys who end up shooting the big bucks. Anyway, here is Kirby’s story of the biggest buck he has ever shot as told in his words. There are 5 guys in our hunting party working the bluffs of Buffalo County, WI. 3 of the guys are heads down real serious hunters. One of the guys is the land owner and is there to make sure his buddies have a successful hunt. I am there just to hang with the boys for a fun weekend in camp. Since everyone knows I like to cook, I have been appointed head chief in camp making sure everyone gets fed. The hunting part is just a bonus for me. We have been hunting all weekend and only have one buck down. We decide to do a little controlled milling putting the 3 serious guys in stands. Mike and I are going to do the milling. Once the boys are in place Mike and I start to head out. As we head into the woods Mike hands me his 270 and tells me to sit in a stand. He believes that this spot is the back door the deer will sneak out while he is milling so he wants someone there. A few weeks before the hunt I broke by wrist in 3 places and could not really hold a gun and pull the trigger. I also am not familiar with Mike’s 270 so that makes me nervous as well. None of that matters to Mike. He tells me just to sit and make sure nothing gets out the back door. So I climbed up into the tree stand and figured I could get a little nap! It’s now an hour later. I have had a brief nap and solved all the world problems in my head when all of a sudden I see 2 huge bucks and a doe heading towards me at about 150 yards. I raise my gun and place it on the gun rest built into the stand and follow the first buck in the cross hairs of my scope. They get closer, now around 100 yards away, my heart rate increased and I could see the huge rack on both bucks. Do I shoot, or wait until they get closer. Just then the doe and the last farther of the two bucks see me and start to turn. The closer buck had his head down and I was focused on him. As the other 2 deer turned to head away I placed my finger on the trigger. Keep in mind that with my wrist I couldn’t grab the gun. I could only put my finger on the trigger. I used my left hand to keep the gun firmly pushed up against my shoulder resting on the bar of steel in front of me. I could not grip the rifle with my wrist being the way it was. There is a lot to be said about being as stealthy as possible when hunting deer. Especially when using a bow. It is hard enough to draw back on the deer and remain un-noticed. Keep in mind that you don’t want to shoot at them when you have their attention. Watch the doe in this video. She actually sees the arrow coming at her and ducks out of the way. If your target is staring you down after you have drawn back, wait until they relax for that split second before firing. Sorry it has been a while since I last posted. We had a death in the family and then Christmas that pulled me away. But I am back so stay tuned for more great hunting stories. What a buck! I was fortunate enough to take this dandy while hunting in Buffalo County, WI on the second day of the gun season. Earlier in the morning, my friend Pat Chapman and I decided to take a break from our stands for awhile and come up with a new game plan. Around 11:30am, we decided to both sit by a large tree on the edge of a shallow ravine. There weren’t many deer moving up to this point so we figured with lunch time coming up, people would start heading in and this may stir things up a bit. Pat was facing up the hill and I was facing down into the draw. At about 12:15, I noticed a deer coming towards us, about a hundred yards away. Luckily, there wasn’t any wind at this time. As the deer approached, I whispered to Pat, “Don’t move, don’t move” while he was standing behind the tree texting in his Fantasy Football picks. The deer went down into a low area and this allowed me to get my gun up and the safety off. When it came back up, it popped out of a little cluster of trees about 40 yards away. This was when I first saw his rack, the left side. My first shot hit him in the side, behind the shoulder and little bit low. Amazingly, he then ran straight towards us and stopped at 5 yards. At this time, it was obvious just what size of deer he was. I hit him again in the shoulder area and all he did was shudder, turn and ran slowly about 20 yards. He then dropped to the ground, and his head went down. At this time we were both pretty excited, it the biggest deer I had ever taken. A moment later, he actually got up and began walking slowly away. Pat yelled “Hit him again, hit’em again” but in the all the excitement, I had managed to jam my gun. Luckily, Pat backed me up and put one more in him that put him down for good. It was a great day in the woods and what made it even more memorable was to have someone there with me to witness it. Thanks to Pat for all of his help.